Lynette's Photo Art: Free Shutterfly Book giveaway for YOU! Here's something new and exciting - Shutterfly will give five people I send them a FREE BOOK!!! I thought I'd share this with YOU! I have to send them your names before March 23rd and only those who haven't purchased from them previously can participate. I'm going to make this into a fun contest that will benefit you and support the blog (which it needs greatly)! The first five people who spend $10 or more in my store or donate $10 to the blog will be the names I send in for the free Shutterfly books. This is a great deal that will help us both and what a perfect time for it too with my huge new spring/Easter themed kit, Bunnies 'n' Bows, newly released and on temporary sale for only $3.99. Take a look at the product previews in the side columns and follow the links to their sale pages or go to www.lynettesphotoart.com to shop. Donate through PayPal to lynettesmail@bellsouth.net. Hurry as I must submit the names before March 23rd and be sure to leave the e-mail address you want me to contact you with in the "note" section when you check out at PayPal! 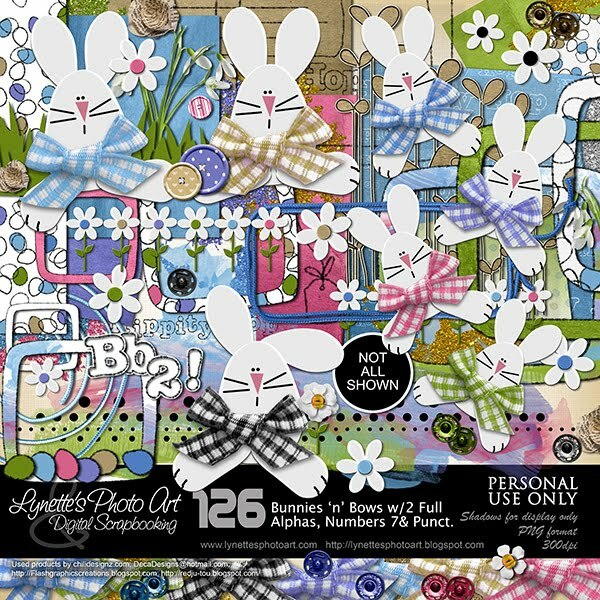 Thank you for sharing your freebie from this cute kit.